<section begin=fatext1 />Magic Pantheism began as all good religions do, with a hearty breakfast. Then some other stuff happened. After the stuff happened the followers of Magic Pantheism, Magic Pantheists, were captured by and forced to cook for the Egyptians, whose love of thin pancakes exceeded even their love for walking like themselves. After brunch, the Magic Pantheists, recently freed from cooking servitude by their leader, Moses, got lost in the desert while on a walking tour of the Sinai. By dinner they had settled in the Canaan region of the Middle East, renaming it Panistine (modern day Israel). The next day, during the slow period in between the breakfast rush and the lunchtime crowd, they were crushed by the Babylonians (or perhaps the Persians, Assyrians or Greeks...the history is muddy), who couldn't appreciate the simple joys of a thin pancake, and the Magic Pantheists disappeared back into the mist whence they came. 1:1 In the beginning God created the pan and the crepe. Gen 2:17 But of the secret of the knowledge of the pan and the crepe, thou shalt not eat of it [the crepe]: for in the day that thou eatest thereof, and cook thereon [the pan], thou shalt surely die. 1:3 And God saw His reflection, and the reflection of Him, in the pan, and on the pan; and He saw that it was good. 1:4 And ON did God turn the gas, and the range, and the gas for the range. And He did hit the ignitor, for the stove was not self-lighting, and the range also was not, as He had an old house and was meaning to redo the kitchen and He never seemed to have the time to do the redo that He intended to do; and His wife often nagged Him about the kitchen, and its need for redodening. And He said "Let there be light. ", and there was light. 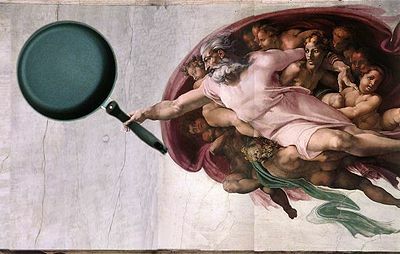 1:5 And God did continue to ponder His plans for His kitchen, and He did drop a pat of butter on the pan. And He did drop another pat. And another, until seven pats of butter were on the pan. 1:6 And God saw that it was good, and there was not too much butter, and there was not too little. And seven was the number of the pats; and one was the number of the pan. 1:7 And there were several more pans stored away in another of His cabinets, one of which was for crepes, and He did not use these pans as this pan was a clean and good pan; and He did not want to reach in to the cabinet as there He once saw a spider, and it was big, and hairy, and had googly eyes, and yea its eyes did google; and long were its spidery legs, and that is another story. And also His back wasn't what it once was; and the other pans, and the pan for crepes, were in the bottom cabinet, and they were at the back with the spider whose eyes did google. 1:8 And God did move the pan over the flame. And God said, "Let the pan under the butter be heated unto one place, and let the pats melt. ": and it was so. 1:9 And God saw that the setting was too high and He did turn it down, for He did not want the butter to burn: and God saw that the lower flame was good. 1:10 And the butter, with pats of seven, was melted. And it did not burn: and God saw that it was good. 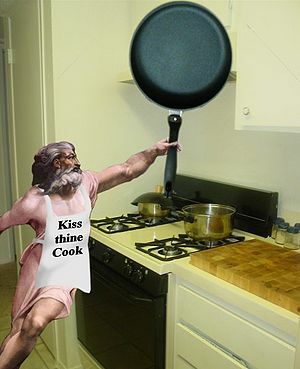 Gen 2:9 And God was not as tall as you would imagine; and He was as small as His pan was large. And truly the pan was big; and big was the pan in His tiny hand. 2:10 And God would appreciate it if you would not comment on His shortness, and His lack of height, and also His small stature. 2:11 For mighty is the wrath of God when people point out this thing, and this thing, and, yea, this thing as well. 1:11 And God did not write the part that comes now down, and we do not know what happened next. And we must assume that it involved the mixing of ingredients, and the spreading of the mixture on the pan, and the cooking of the mixture on the pan on which it was spread. And so we shall skip ahead. 1:31 And God saw the crepes that He had made, and, behold, they were good. And the evening and the morning were the sixth day, and this is a long time to wait for crepes. 2:1 Thus the pan and the crepes were finished, and God did take them out to the friends of God who were waiting in the room of dining, and they saw the crepes. 2:2 And all the host of them did gather closely to take the crepe, and the crepe, and the crepe, and soon the crepes were one. And Brad did by accident bump the elbow of Shirley, and he did cause her to spill some of her wine. And Brad did apologize to Shirley, and she did ask God for some seltzer; and did put the seltzer on the blouse quickly, and the stain did not set. 2:3 And seated roundly about the table of dining they blessed the seventh crepe, and sanctified it: because in that God had rested from all His work of the cleaning, and the buttering, and the cooking of the crepes which God created and made. 2:4 And verily they did eat the crepes and they said "Truly, these crepes are good." And they asked Him for more, but He had started already to clean the pan, and He was out of eggs, and milk He had none, and low was the bag of flour. And He said "No. "; and they were sad, and their sadness was tempered by the crepes which they had gathered to eat, and they leaned back in the chairs, and did undo their belts. 2:5 And they did afterward ask God about the making of the crepes, and He did tell them not of the mystery of the kitchen, nor of the butter, nor of the recipe. 2:6 And they did continue to bother Him and did keep inquiring of the secrets of the crepe. 2:7 And filled with annoyance that these men, and women, and children, and old, and young, and that neighbor that He didn't really like and did only invite over to ask that neighbor to return the mower of lawns that the neighbor did borrow and did not remember to return, or remember that He ever did borrow it at all, God said "The pan; it is magic." Little else remains of the Magic Pantheist Bible. A small scrap from the Book of Reservations tells us that "...Bremmer, party of four, 8:00pm..." requests a booth, and "...Goldman, party of two, 12:35pm..." will be eating from the kosher menu. Most importantly, it states "...Smith, party of four, 9:15pm...", which is clearly a prophecy about the imminent return of the One True Pan. ^ If this humble page hasn't answered all of your questions about Magic Pantheism, we don't know what will. ↑ We don't know what will. This page was last edited on 22 June 2012, at 01:27.